This is one decidedly delicious smoothie that’s super easy to make with only two ingredients. It’s my version of an Orange Julius. When blood oranges are in season I load up and enjoy a fair amount of them blended into smoothies. I find their crimson, almost blood colored flesh both beautiful and mouth-watering. Anthocyanins: give blood oranges their excellent red color (also give blueberries their dark pigmentation). Anthocyanins are antioxidant powerhouses, have anti-inflammatory properties, and provide protection against cancer. Vitamin C: also a powerful antioxidant, vitamin C plays a role in a number of bodily functions such as wound healing, collagen production, and boosting the immune system. Folic Acid (vitamin B9): good for your heart and protects against certain cancers. I purchase blood oranges directly from growers in the U.S. via Local Harvest. 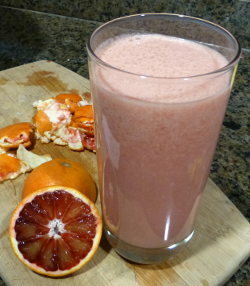 Combine the health benefits of blood oranges with the probiotic punch of kefir and you have one healthy smoothie. This is more of a snack than a meal replacement. Incorporate some of the add-ons or your favorite ingredients to make a meal out of it. Enjoy! I’d love to know if you try this blood orange kefir smoothie and how you liked it. Please leave a comment below. Happy Blending! Ryan, I’ve given your website to numerous people I know… have a cousin in N.J. who is making her own Kefir. Thank you for all your great smoothie recipes/articles! And, I will continue to refer your website to people who I feel will benefit…!